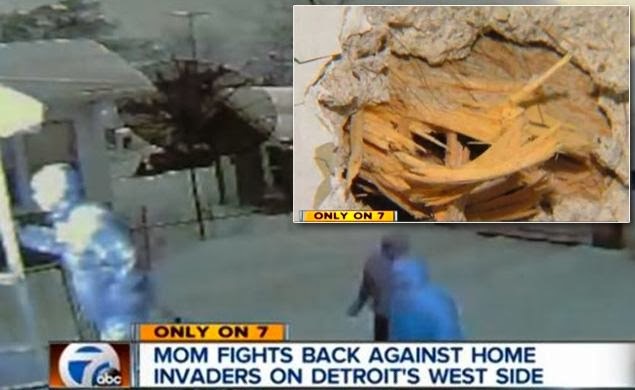 Three teenagers muscled their way into a Detroit home on February 17 but did not reckon that they would encounter a mother who would stand her ground and use any means at hand to defend her family. It was on that evening that an unidentified mother of two protected her family with what local media termed an “assault rifle”. CCTV recorded that three male teens bashed down the back door of the woman’s home. One of them was armed with a shotgun while another carried an apparent pistol. She told a local ABC affiliate, station WXYZ that she “didn’t have time to get scared,” but she was frightened after the break-in took place. When the mother heard the sound of the bursting door at approximately 7:30 p.m., she immediately went to retrieve her weapon. In photos and video released by local police, it appears that she was armed with a carbine manufactured by Hi-Point Arms. Carbines such as these are designed to fire pistol ammunition in calibers such as .45, 40 SW, and 9 mm. Assault rifles, such as the AR-15 used by the military, fire larger rounds designed for rifles and that are much more potent. When the teenaged marauders called the woman’s bluff and claimed that she did not have a weapon, the mother opened fire. Confronted with the valiant mother, the three boys fled. When two of them ran from the scene, a third can be seen in video dropping his pistol in the snowy driveway on the way out. However, he retrieved the pistol and attempted to re-enter the dwelling. The mother fired again and scared him off. "I let them know I had a gun once they were in the house and they challenged me and said 'no you don't have a gun' so that's when I shot off the first round," said the woman. "I wasn't feeling anything at the moment, I got scared afterward," she added. The incident was captured by a video surveillance camera at the home that the father of the family had only recently installed following another break-in earlier in the month. They live on an otherwise quiet tree-lined street. Detroit Police Chief James Craig said the woman’s shots did not strike anyone. “I believe she did the right thing,” said Craig who added that he believes legal gun owners can deter crime. Detroit police responded quickly after receiving a distress call from the mother. They apprehended three suspects, who are now cooling their heels in jail. Two are facing criminal charges for home invasion. One is facing a weapons charge and another is facing no charges at this time. Miraculously, no one was wounded in the affray. One of the teens is fifteen years old, while the others are 14-year-old twin brothers. As it turns out, the pistol used by the teens was actually a toy. Sgt. Woody said that the home’s surveillance camera showed that the marauders teens cased the house for more than 20 minutes. While they were in the back yard, the teens tried to enter the garage.